Tesla wants to dip even further into the solar power pool with newly announced plans to partner with Panasonic to build solar panels for Tesla’s Powerwall and Powerpack battery backup systems. Panasonic has already been building Powerwall batteries, as well as electric car batteries, at Tesla’s sprawling Nevada Gigafactory, but this would be the electronics company’s first foray into solar panels with Tesla as a partner. There’s just one hitch: none of this can happen until Tesla’s $2.6-billion acquisition of SolarCity goes through, a move which has been plagued by legal hurdles and awaits a shareholder vote in November. 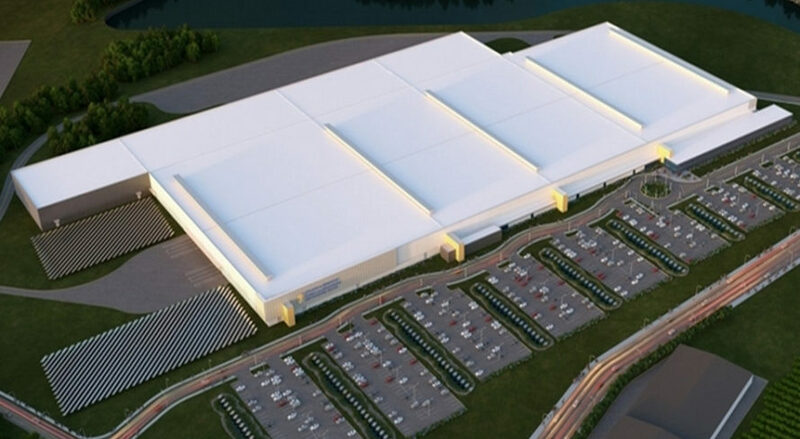 If Tesla‘s acquisition of SolarCity is completed, Panasonic would quickly begin building photovoltaic (PV) cells and modules at SolarCity’s $750 million manufacturing facility in Buffalo, New York, which is incidentally also called a Gigafactory. In a statement, Tesla explained that the Panasonic-produced solar components would be sold as part of a “solar energy system that will work seamlessly with Powerwall and Powerpack, Tesla’s energy storage products.” Tesla has agreed to a long-term deal under which it would purchase PV cells from Panasonic, while providing the facility in which to build them. The announcement of this product line comes on the heels of Tesla/SolarCity’s promise of a solar roof with integrated connections to the Powerwall storage system (and, of course, an included Tesla car charger). The official product unveil for the solar roof is set for October 28, despite the fact that Tesla’s acquisition of SolarCity won’t be a done deal before the shareholders vote on November 17. Panasonic and Tesla already partner to build batteries at the car company's Nevada Gigafactory, and now Tesla wants Panasonic to build solar power components for its energy storage systems. If Tesla's acquisition of SolarCity is approved by shareholders next month, Panasonic will begin building solar cells and modules at SolarCity's Buffalo Gigfactory for Tesla's Powerwall and Powerpack systems.